Originally published by Leher, as part of their #LittleHumans blog series here we profile five children from Saraswatipur – hear about them and their ambitions. Saraswatipur, a cluster of picturesque villages situated around sprawling tea gardens in the north of West Bengal is about 30 kms away from Siliguri. Positioned on the banks of the Teesta River, on the edge of the jungle, one can’t miss the view of the Himalayas on a clear day. The predominant line of work is at the tea estate – picking and processing tea leaves. From a population of 2000 people, 1500 people are employed by the tea factory, passed down across generations. Today, this tucked away little village is being known for more than just its tea. News from the region boasts of the burgeoning young talent on the rugby field. In 2012, Father George Matthew was transferred to Saraswatipur to head a local parish. He noticed the athletic potential of the children and reached out to the Khelo Rugby team, to bring the program to the village. Within a few weeks, two coaches moved to the village and the program was set up within a month. Ever since, the program has seen unprecedented success with the children of Saraswatipur playing for the West Bengal state and national Indian rugby teams. Khelo Rugby brings adventure, challenge and excitement to the lives of children. Present in Kolkata and parts of West Bengal, this program has also made its way to Afghanistan and Pakistan, reaching out to children from disadvantaged communities by incorporating sports as a social development tool. Managed by youngsters themselves, Khelo Rubgy is building this program with scholarships and a curriculum of social issues. This week, we bring you stories of Little Humans from Saraswatipur for whom the rugby field is now second home. Eliyas is a very smart 8th grader, studying at the Rajaranga National Hindi High School. He excels in all of his classes, but Hindi is his favorite. Yet, Eliyas’s passion is playing rugby. He has been playing for 4 years and never misses practice. His favourite positions are center back and flanker and he is always chosen to throw the ball in during line outs. He brags that he is the best passer on his team and can pass accurately to his left and his right. When he finishes 12th grade, Eliyas wants to move to Kolkata. He has heard many stories of the city from friends and family who have been there. Sonali is 12 years old and is in the 8th grade at Katalguri Junior High School. She loves History because she wants to learn about how people lived a long time ago. Her mother says she is very dedicated to her studies, but waits eagerly each afternoon to play rugby. Sonali joined Khelo Rugby in 2013. She was a little shy at first and would sit on the sidelines and watch the others play. But soon enough, she mustered the courage to play, dove right into the game and never looked back. For Sonali, although playing rugby is great fun, the most important aspect of her practice is fitness. When she turns 18, Sonali wants to join the Air Force and she knows that being physically fit is a critical component of this. She admires those who have volunteered to serve their country and wants to follow in their footsteps. John Paul has swag, both on and off the field. In the mornings, he takes a bike to school along with the older Saraswatipur children. Most students take 30 minutes to get to school, but John Paul brags cheekily that he can make it in 20. Both his parents pick leaves at the tea garden, but when he grows up, John wants to be a forest ranger like his uncle. Saraswatipur has weekly run-ins with wild elephants that can be quite dangerous. John’s uncle plays a crucial role in protecting the elephants and their habitat while also keeping them from hurting people in their search for food. John wishes to grow up and help protect his family and friends from the elephants and ensure that the elephants can still safely live in the jungle. Rehan is a shy, young, 10 year old boy who lives in the tea garden village of Saraswatipur. His day starts at 5 am every day when he gets up to do his chores and help his mother sweep, clean, and feed their livestock. After he finishes, this 5th grader packs his bag and heads to school. Rehan’s favorite subject is Bangla because he loves reading novels. Once school gets over at 3 pm in the afternoon, Rehan walks home and sits down to do his homework. Once he finishes, he rewards himself by watching Hindi serials on TV. Although Rehan is a reserved person, he’s quite the opposite on the rugby field. He was introduced to Khelo rugby by a friend 3 years ago and has been playing rugby ever since. Speed is essential in rugby and Rehan is fast enough to play every position on his team. When he graduates from school, Rehan dreams of following in his sister’s footsteps and moving to the big city. A few years ago, Rehan’s sister was offered a position working for Decathlon in Kolkata and Rehan hopes to work with her when he grows older. -Thanks to Leher for agreeing to let us publish these stories on our blog – learn more about Leher from their website, facebook or twitter! Originally published on his own blog “Off-Season”, Harry A Johnson is a Watson Fellow scouring the world for the most innovative uses of sports as a vehicle for social change. Here he writes about his experiences visiting Saraswatipur for our Kichad Rugby Festival. Some may argue this point, but to my knowledge, the POLYTECH High School Boys Basketball team from 2009-2013 has to be the most dominant team of all time in the Henlopen conference. During my four years at POLYTECH, we did not lose a single game in our division –completing a streak of 65 straight games– and only lost two games in the conference over my three years as a starter (go ahead and correct me if I’m wrong). Our team’s mantra quickly became “We in the JUNGLE! !,” describing our high speed, in your face style of basketball that suffocated other teams. Less than one day after arriving in India, I was once again in the jungle. However, this time I was on a rugby field surrounded by trees standing 100 feet tall and the under constant threat of elephant attacks. More surprisingly, I felt right at home. The first program that I am exploring here in Kolkata, India is Khelo Rugby. This sports-based social development initiative uses rugby as a vehicle to counter a number of social issues (ie. poverty, homelessness, lack of access to education) and works to ensure that Indian youth grow up with the best of opportunities (a more in-depth review of the program will come soon). The program works in over 45 communities throughout India. During my first 24 hours here I got to accompany the program on a trip to Saraswatipur, a group of villages in Siliguri — a small town in the jungle foothills of the Himalayan Mountains. Saraswatipur is a tea estate made up of a cluster of 4 villages. The lives of children growing-up in these villages are embedded in the larger context of life as a tea garden worker. 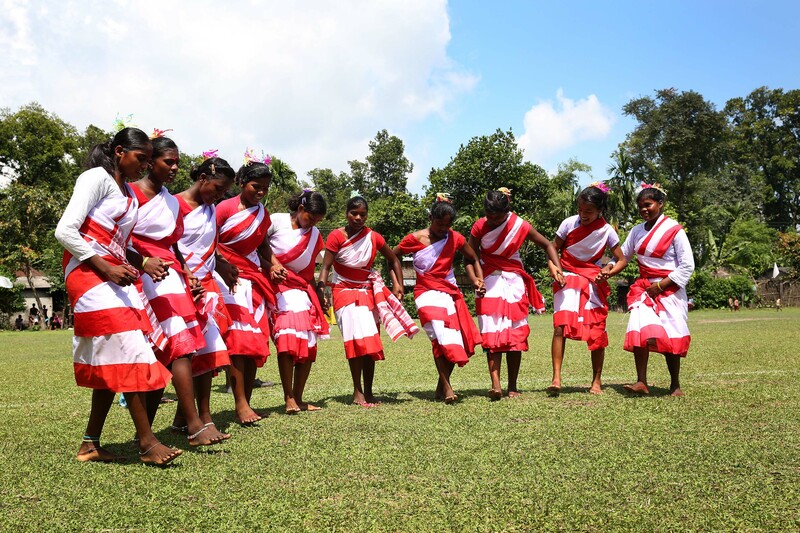 This is because more than 90% of the people have Adivasi tribal backgrounds meaning they were brought in as indentured labourers to work in the tea gardens at the start of the century. The villagers live in basic conditions, make meager wages (85 rupees/day= $1.33/ day), have limited access to the outside world and a lack of employment opportunities beyond the tea garden. In addition, the village is plagued by rampant alcoholism, illiteracy, lack of schooling, poor sanitation practices, lack of safe drinking water, oppression by Tea Garden owners and the constant threat of wild animal attacks (e.g., elephants, leopards). Khelo Rugby began in Saraswatipur in March 2013. Since then, Khelo has trained more than 500 children in the sport of rugby. Along with rugby training, Khelo has conducted youth development camps, provided various sports-based opportunities (e.g. participating in Rugby tours and Rugby tournaments organized in India), secondary school scholarships, and work opportunities. The program has 26 children from Saraswatipur in the Khelo Scholarship program and 4 former players (2 girls; 2 boys) are currently working with Decathlon, an international sports brand. This past summer 5 girls from Saraswatipur were selected to the U18 Indian national team which participated in the 2017 Paris World Games and another four girls were selected to the U20 Indian national team which played in the Asia U20 rugby tournament. More importantly 3 players have gone on to college and to the programs knowledge they are the first three in what may be centuries. Khelo’s work continues to expand as the program is currently fundraising to build a youth center in the village. The focus of my trip to Saraswatipur was to help in the coordination and execution of a rugby tournament for kids aged 14 and under. The tournament was then followed by a cultural celebration in honor of the International Day of the World’s Indigenous Peoples. This quickly turned into a cultural exchange between the people of Saraswatipur and myself. As I walked around the town, I was met with unapologetic stares that did not seem to cease over my stay. Although I was taken aback by the attention, I slowly realized the stares were a sign of interest and curiosity. It was hard to communicate with many of the villagers because they have their own language which is a mixture of Bengali, Nepali, Hindi, Bihari. Anyone born outside this village will struggle to follow this mix. Fortunately, some of the villagers knew a small amount of English. (English is known throughout India because it is the language of government, law and medicine.) As I engaged with those around the town, it was evident that the beauty of the landscape was a reflection of the people of the land. I felt at home as I was welcomed into home after home, chased around by small children and shook well over 200 hands during my three day visit. The tournament went on without a hitch. Over 335 children from Saraswatipur and neighboring tea estates participated in the tournament and both first and second place teams were honored with live chickens. Paul Walsh (Director of Khelo Rugby), Brian Wolf (Bard Graduate and former member of the Khelo Rugby team) and I were surprisingly honored as chief guest in the cultural festival following the tournament. The villagers packed a Shamiana (bamboo built structure to house the event) that the youth built the day before and we enjoyed a display of the cultural roots of Saraswatipur. Four days into my trip I was asked to speak in front of a crowd of over 300 villagers. Looking back, it is amazing that I wasn’t at a loss of words. I stood up and told the people they embodied the foundation of the trip I had just barely begun. Their village was a prime example of the power of sports, and their ability to combat social ills with century-old roots, increase access to opportunity, and change both individual lives and the world at-large. To conclude the ceremony, the Chief minister of the region stood before us and thanked Paul Walsh and Khelo rugby for “Bringing opportunity to their village.” I looked over at Paul and chuckled thinking all of this came from a simple introduction to a “girls sport;” Rugby. How our Winter Rugby Camp has grown and grown over the years to include more children and support the development of more and more coaches and leaders. Christmas Day 2016 saw 1064 children playing on or around what we call Crow Field on the Calcutta Maidan. And even more exciting than the chance for these children to play and have fun on a winter’s morning was that most of the event was planned and delivered by 117 trained young coaches, all committed to their safe and fun enjoyment. This was the 12th year of our Jungle Crows Winter Rugby Camp and 2016 saw it bigger and better than ever. From day one – 24 December to day nine – 1 January the average morning attendance was 959 children and 109 coaches. 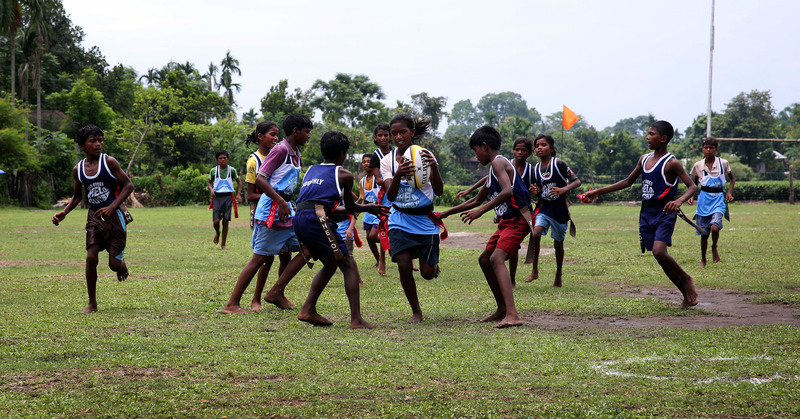 1443 children from 26 different communities from across Calcutta played. All part of our Khelo Rugby project which takes sporting and other social development opportunities into places it doesn’t always reach. The planning and delivery of the camp is an integral part of the experience and our young Khelo Leaders drawn from across Kolkata did an inspiring job learning a huge amount in the process. We were superbly assisted by Chef Shaun who managed to bring a little competitive spirit into who could deliver the top breakfast as well as win a tug of war versus a team of 12 year olds! Shaun was up every morning providing hot tea and orchestrating the breakfasts. Also calling in each day, inevitably on his way back from surgery was Jungle Crows Chairman Dr Hasan Iqbal to give cheery encouragement. And we’re indebted to those hotels and companies that supported the camp by delivering more than 15,000 bananas, 6000 boiled eggs and innumerable frooties, cakes and small gifts for the children. Turning up and playing with the children in the early morning after long hotel ‘party season’ shifts was great to see, take a bow; Indismart, Taj Bengal, Oberoi Grand, Decathlon, Balaram Mullick, Paris Café, Novotel, Kookie Jar, TIL, Swissotel, Bangalore Biere Club, Wow Momo, CDE, Hyatt, Savourites, Kutchina, Mio Amore, ITC Sonar and Hakuna Matata. When our Winter Camp started 11 years ago there was no greater aim than to get a handful of children up and out and playing on a winter morning. And fundamentally this is still at the core of the camp. Giving children a motivation to play and enjoy our fantastic Calcutta winter mornings. But we can also now see how the camp has many more positive impacts. As a super way to engage with our Khelo Rugby children and teach them new things. As a practical hands on management training experience for the young coaches. As a great fun CSR project for a whole load of organisations. The Winter Camp provides a valuable focal point to all our work with children and communities. The growth of the camp has been phenomenal and now attracts volunteers, visitors and supporters from around the world. And it doesn’t just happen on the Calcutta Maidan. We’re now in our second year in Bangalore: five mornings with 150+ children each day, second year in Siliguri: five mornings with nearly 400 children each day and for the first year in Uluberia supporting Decathlon’s work there with three mornings of camp and over 150 children each day. That’s over 2000 children in the camps with 35% of them girls. In 12 years living in Kolkata I have only been away from the Maidan on Christmas morning once, this makes me a little bit crazy for sure, but I wouldn’t have it any other way because I just love these madcap winter mornings. Click here and you can watch a brilliant little film on the camp made by our mate Rohan! And if you would like to read the full detailed report on the camp please be in touch and we’ll send you a copy. The Jungle Crows Foundation has been conducting its annual Winter Camp at the foggy environs of the Kolkata Maidan for the last 11 years starting from the year 2004. It is normally an event that lasts about 10 -11 days and involves engaging hundreds of children from several disadvantaged communities for a couple of hours each morning. Rugby is the principal sport and the camp involves the participation of the children in several play based activities developed around the central sport of rugby. The legacy of the Winter Camp has been well established through several journeys over the years of youth being transformed from a life of meager future to successful players and individuals who are able to take control over their lives. The Camp has been growing in size due to the growth of our Khelo Rugby project which is getting involved with more and more communities across Kolkata. The objectives of the Camp and the Khelo Rugby project revolve around the idea that play can be a huge positive, a belief that all children, irrespective of their socio-economic background, deserve to develop themselves through the medium of play and this supports them in fulfilling their potential. In a society rift with inequality and casteism, the programme aims to aid children break through the dogma of predestination by providing a support structure based around play, in an environment that is inclusive, non-threatening and aids in self-discovery. The 2015-16 Winter Camp engaged more than 800 children on an average each day from 22 different communities, who were attended to by a team of 75+ volunteer coaches. It turned out to be the biggest camp we’ve ever organised, the biggest anything we’ve organised actually! This Camp involved a lot of planning and turned out to be a huge logistical effort – one of the benefits to all of us this. We had to ensure all the 800 children had a safe transport facility to and from home, a fun-filled Camp session, some basic kit and a healthy breakfast each day. As we prepared ourselves to gain a momentum into the Camp, we felt that it was important to develop a higher objective, so as to create a sense of direction to all the effort and have an over-arching goal. Thus, was born the idea of “Year of Play” – the concept of utilizing the Camp to create a platform for the year ahead, to start our own movement towards the Power of Play. It is quite easy to be cynical about an initiative like this as it is for a short period without guaranteeing any sustainable or measurable impact on the lives of all the children involved. Yet, it contains within it, an essence of an ideal world, a consistent effort for equality and a belief of a new social reality. It is this feature of the Camp, that I believe, makes children participate each day in consistent numbers and compels the volunteer coaches to forfeit their Christmas holidays for this noble cause. Waking up early on a cold smog filled winter morning at Kolkata can be quite a task but the noise and laughter of hundreds of children enriches the heart of any soul who wishes to lay oneself bare to the experience. It was in such an exhilarating atmosphere that we wanted to take the first small step towards initiating the idea of our Year of Play. Within the Khelo Rugby project team, we have developed a set of fundamental principles that we keep in mind as we develop our programmes with children. It basically revolves around teaching children to value their own lives, teaching them something new each time, appreciating them, developing their self-belief, acknowledging their rights, providing them emotional support and working towards building non-threatening platforms for them to succeed in their lives. The medium of play helps us to break several cultural barriers along the way in realizing these principles. It provides an environment where the engagement can take place in a very spontaneous unpretentious way. Taking forward from these fundamental principles we felt like we needed to develop the theme further and use the New Year’s Day to delve, discuss and initiate the activities of the coming year. Perhaps, we were looking for “resolution” of our own. We have become so used to objective singular New Year “resolutions” that the concept itself has become drenched in mindless euphoria. As an organization, we had to ensure that the “resolutions” involved the hopes of others with a spirit of equality and justice. We needed to provide space for the rights of the children of the world. In that sense, we felt that one of the ways to “resolve” for a better tomorrow was by working towards initiating a movement on the topic of PLAY. Not just in a superficial way by playing or teaching someone a game but by acknowledging that the Right to Play of children in the world is directly connected to the various movements of social justice and freedom. That war, violence, hatred and greed eventually effects the way or the amount a child gets to play, to learn, grow and fulfill human potential. That the Right to Play is under threat from the inequality and ecological destruction that is manifesting all around. While there was the theoretical challenge of having to articulate our vision to our children, our team and to the world outside, there was the other challenge of practically implementing it as a visual display of our thoughts. The idea came about of creating the word “PLAY” on our Maidan Crow Field, involving all the children and volunteers who participated in the camp. The preparations began a day earlier by marking out the field through outlines and cones. As the day started, the coaches were encouraged to hold open discussions or a “Charcha” over the topic of Play with the children, trying to make them understand what it meant to them in their lives. We then moved onto the Herculean task of arranging all the 900 odd children in the formation of the four letters, with all the coaches keeping a vigil and making sure everything was in order. It turned out to be a lot easier than expected and when the formation was finally done, our team was brimming with a sense of achievement. A few slogans were chanted on the theme of Play, a mass wishing of Happy New Year took place, great photographs taken through some daredevilry up trees, breakfast distributed and finally all returned home overwhelmed by the feat! Providing opportunities to as many children as possible to have a safe play experience. To promote the participation and support for girls and their participation in their own journey of self-discovery through play. To bridge gaps and fight inequality by being inclusive in all our endeavors. To aid in the development of the culture and market for sports so as to develop play as a worthy effort for participating children. To establish platforms for advocacy that can minimize the hurdles for success through play. To innovate and create new designs for play spaces and play grounds, such that it stimulates play based activity in all communities. To acknowledge rights of children and launch a fight against child abuse by creating awareness among children themselves through the medium of play. To acknowledge that the children are the future and the next year needs to provide the basis for better years to come, a better tomorrow full of hope and promise because our children deserve that. So, we at the Jungle Crows Foundation, are going to try our best in our own small way to develop our program around these points. For all of us who have been a part of the Winter Camp, it has been very memorable as we soak in the positivity, delve on the negative points and look to better ourselves for the future. At the same time, we invite development organizations and governing bodies worldwide to join our endeavor, for what lies ahead of us is a huge task. Year after year is turning out to be more harmful for the lives of children as the threat of both man-made and natural disasters looms large. So the idea of play and its universal appeal has become more relevant than ever before. We need to believe in it, for sake of ourselves and the children. It will involve debunking a lot of myths, reshaping our identities, re-learning our histories, re-assessing our self-worth, introspecting deeply on our delusions and liberating ourselves to a brighter future. However, and most importantly, it involves engaging ourselves in the simple safe, fun-filled, powerful activity of PLAY. Let us all cheer for a Year full of PLAY!! Jungle Crows Winter Camp has been running for 11 years now and goodness has it grown! Just on Christmas Day alone the programme attracted 787 children, supported by 66 coaches, and the camp goes on for 11 mornings. Many children get up before 5am, to travel by chotahathi (small truck) to get to the Maidan. While this year the temperatures have been milder (I still remember 2012/13 winter when temperatures dropped to below 10 degrees! ), it is damp and foggy when the children first arrive. They have travelled from as far away as Bhattanagar in Howarah and Brooklyn in Khidderpore. So at 7am, the coaches full of energy, encourage children to play bulldog, dance and skip around for the first 20 mins, simply to get warm. The coaches then take their groups of circa 25-40 children, let me tell you just organising this is a feat, to begin the serious stuff – having fun! The coaches stick with the same groups, so they get to know the children, each coach is supported by less experienced coaches and volunteers, most have rugby experience, but a few are simply passionate about putting something back into the community. Amit started coming to the camps 10 years ago, as a shy boy, today, I watch him coach a group of u10s, full of confidence as a young man, who takes great pride in the trust he has developed, watching the children grow, hoping they too might become Jungle Crows players and coaches in the next decade. Nanda as a senior coach and has been involved in the Jungle Crows since 2007, and as both a senior player and coach, he takes a leading role in the preparation and coordination of the programme, months in the planning, working with Hari, Shreyas and Pritam. Nanda’s love of children, and seeing smiling faces clearly motivates him to keep coming back. He says their smiles, are the best reward, but with a special opportunity to teach rugby skills and maybe even find the next Tiger to join the Jungle Crows within the u14/19s groups? This year is Sahil’s first winter camp, he was in Amit’s u10 team, and has been completely won over by playing rugby, citing his dream of becoming a rugby player when he is older. He has already ‘signed up’ to come next year! The coaches work in the various communities throughout the year, Lovepreet has been involved over the last 4 years; by day 4 he has practically lost his voice, from shouting such passionate encouragement to his young u10 group. He is committed to the development and education of young children, saying that this programme teaches the children respect for themselves and each other, learning to work in a team and how to behave both on and off the rugby pitch. At the end of each day, the children are given a breakfast kindly donated by hotels and businesses in Kolkata, let me tell you, it takes a lot of work to distribute 800 bananas, eggs, cakes, and juices. Some mornings, toothpaste and tooth brushes, with the coaches reinforcing the need to brush teeth twice a day. These teaching moments, happen at the end of the frenetic morning, when the kids form a circle within their groups, sit in the warm sunshine and listen intently (well the majority do!) to the coach. There is a calmness by 9.15am, with everyone either tired from the morning’s fun activities or just wanting the chance to catch up with their newly made friends. This programme does not happen by chance, the Jungle Crows, led by Paul Walsh MBE, requires mammoth planning both in advance and on the day: trucks to be booked and driven, registers to be taken, donations requested and gathered, T shirts to be bought and printed (we distributed over 850 on Christmas Day morning), with a few going without such is the success of the event). Then by 9.30am, the children start gathering up their belongings, and head back to the trucks. Each thanking their coaches for a great start to the day, munching on their fruit as they start the journey home. The coaches have a quick catch up, what worked well, what could be changed and then they find the energy to play a quick game of rugby, because it is this game that binds these young adults together. The Jungle Crows are an amazing extended family, who like any family work hard and play hard together. But they, unlike many families, need the support of their city – Kolkata, this 11 day programme costs 6+ Lakhs and the Jungle Crows rely solely on donations and goodwill of the community both here in Kolkata but also from further afield in the UK and elsewhere. This year we have also run programmes in Siliguri and Bangalore, managed by coaches from the Jungle Crows, who have again gone into the local communities to seek out communities who need the Jungle Crows support. Even as I am typing, I can hear the children chanting and singing – playground games, it is this happy chatter which keeps me coming back to Kolkata, the Jungle Crows make a difference and that surely is something to crow about? Ed’s Note: Emma is also an ace photographer, all images here are hers and she’ll go to any length to grab the best shot! 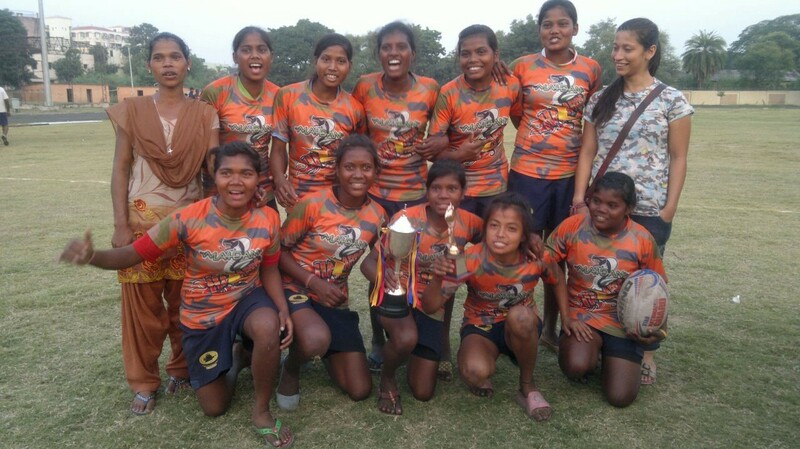 Talking Rugby Futures: In the second in our series of interviews Disha Musaddi talks about life and rugby to four young girls in the Jungle Crows programme from the rural villages of Saraswatipur part of Siliguri district – Kirpa Oraon (19 years old), Sandhya Rai (14 years old), Sanjana Oraon (19 years old) and Punam Oraon (17 years old). Kirpa – I am from Saraswatipur and am studying in class 10 of Gajaldoba High School. I have been learning and playing Rugby for the last one year. Sandhya – I’m a student of class 9. I am from Saraswatipur; many don’t know about this village, hence, we say Siliguri! I stay with my parents and brother. Punam – I am from a family of 6 and live in Saraswatipur too. I am studying at Gajaldoba High School and have just started with class 8. I have been involved with Rugby for the last one year and it has been an enjoyable experience as it has had a major impact on my life. Sanjana – I hail from Saraswatipur, Siliguri and live with my parents and a younger brother… I am currently in class 10 of Gajoldoba High School, and shall be giving my Madhyamik Pariksha (Board Exams) in a month’s time. I have been playing rugby for Jungle Crows and I really enjoy playing this sport. How and when did you start playing rugby? Kirpa – It was Father Mathew who told me and a friend that he’s bringing the game of rugby through the Jungle Crows Foundation to Saraswatipur, where both boys and girls will have to play together. He trusted us and wanted us to inform others about this initiative, so that more children could participate. In the village, many leave their studies mid way, hence Father Mathew believed that this sport would benefit the children of Saraswatipur. People were very hesitant at first, and we convinced them by telling them that playing would be great fun and that they could meet new people and learn a lot from it. We started with tag and touch rugby. Harry sir and Amirul sir were our coaches then. Father Mathew was very happy with the turn out and so were we… we were more excited about playing a new game…we have now started focussing on the tackle format as well and have played many tournaments like the national ones in Bhubaneswar and Nagpur. Now we are going to represent Bengal in the National Games in Kerala. We have travelled a lot through this sport, which was unimaginable. I could not go to Orissa for the tournament, but I was very happy to hear about the girls’ success there. To be honest, I was a little upset even as I wasn’t a part of the team. My first big match was in the National U18s in Nagpur where we were runners up. On seeing the medal, my parents were thrilled. I personally feel there’s a lot we can achieve by playing rugby and studying. I want the same for the other children in Saraswatipur and would like to motivate them to go ahead in life. My parents too are very happy with what I am doing. They encourage me to help other girls and introduce them to Rugby. Sanjana – I started playing in 2013 along with all the others. The rest of the story has been told by Kirpa! Sandhya – But we are new to the real (tackle) rugby; we used to only play touch then, now we play more of tackle. I heard about rugby from a friend. Punam – Kirpa di told me about it and she took us to play. She told us that there are coaches from outside (outside Siliguri) who will teach us. What was your family’s reaction when you started playing? Kirpa – My family is very supportive. I knew I wouldn’t face difficulties regarding this, because both my sister and I play a lot. There are no restrictions in my house; they tell us to play instead of stopping us. At home, everybody is of the opinion that if there’s anything good, we should definitely learn it. My parents…well the entire family is encouraging. Punam – My mother supports me, but my brothers stop me from playing, because they think that I will hurt myself… I don’t listen to them… when I feel like playing, I run away and play. Sanjana – Initially, my mother didn’t like my playing and would stop me. I would tell her that I will play since I enjoy and she gave her consent only after Amirul Sir spoke to her. My neighbour objects to it, but I don’t bother about them and continue to train. Who has been and is currently your coach? Sandhya – We’ve had 6 coaches so far. Sanjana – Harry sir and Amirul Sir trained us first… Sanu and Lovepreet sir then we had Sukumar for some time and recently Parvez was also there. Among all these, who’s your favourite? Together – All of them…! Sandhya – since Harry Sir and Amirul first coached us, they’re my favourite. What are the changes you’ve noticed in yourself when you started playing? Punam – I was very wicked as a kid… rugby has changed me for good. Sandhya – Earlier I wasn’t very fond of these girls (Poonam, Sanjana, Kirpa and the other girls) because they were from another village and their team was much better than ours, which made us jealous. Now, we’re a part of the same team so I really like them. Kirpa – I didn’t know how to speak properly with others, I wasn’t disciplined….I gradually learnt all this. The coaches would talk to us and I made it a point to listen to them. When we were wrong, they corrected us immediately and would guide us to do the right thing. If they told us not to do something, I wouldn’t do it. All of them taught us to respect others, as a result we start gaining respect and that we should even respect those younger to us. We should get the younger generation disciplined by showing the same respect and sharing with them the knowledge we have acquired. The chai bagan (tea garden) looks to be a very beautiful place from the outside, but can you share with us about life inside the bagan? And considering the problems people face, what would you like to do for it? Kirpa – In the bagan, the salary is very low…my parents have to leave early for work at 7am. It’s with this in mind that we are studying and hence, we should work hard. Everyone considers the tea garden to be very nice, but that’s not the case in reality. I want to study, work hard and not work in the tea garden and not even let my parents work there… it’s very tedious for them… after working for long hours whatever little they earn is spent on us and our education. Punam – Even my mother works in the tea garden…I don’t like staying there. I want to be sincere with my studies and work and leave the bagan along with my mother. Living out there is very difficult, mainly because people don’t support each other…if even one mistake is made, everyone goes against it and makes a big issue out of it. Sandhya – I like staying there, but people drink a lot making it unsafe for us. The one thing I hate is drunk men lying around everywhere! Kirpa – People in our society don’t seem to understand the importance of exploring the world outside…many of us from the adivasi samaj have been exploited for many years and have just accepted it.. People do not have the money to venture out, so I guess that’s why they don’t understand this. There is gender discrimination. People think girls can’t play but, girls can play and achieve a lot, whereas it’s the boys who are left behind. I don’t listen to them because in my house both boys and girls are given equal chances to play and we are encouraged to do what is good. In Saraswatipur, almost all the girls are interested in the game. But there are some people who stop us from playing…they believe this game is not meant for girls. In fact, it is this game has come for both the girls and boys of the village…they don’t know all that we can achieve from this. Recently, when we went to Nagpur and won a medal, some of the villagers commented that we bought them instead of winning it. There was no encouragement from their end… all they do is to demean us. We don’t listen to them; instead we only concentrate on our game. Sandhya – At times they disturb us while we are practicing… they play cricket on the field and have even made a volleyball post in the ground so that we don’t get space to practice. Sanjana – It’s more like they are jealous of us…..
Punam – They scold us while playing… hey say that we’ll injure ourselves and no one will come to look after us. We tell them that the coaches will see because they are training us, as well as our family is there to take care of such matters. Who are you closest to in the team? Sanjana – Sapna, Raveena, Chanda… almost everyone. Punam – Kripa Di, as she’s the eldest, she is intelligent and is always willing to help us. Sandhya – Malo and Menoka. One good thing about Menoka is that she doesn’t get angry and is always making others laugh. Kirpa – Whenever there’s something to share; I first say it to Sapna then to Sanjana and Reema – they always support me. Who’s your favourite sports person? Sandhya – In rugby, I like Commando (Puspendu, of Jungle Crows) and Bhagyashree from the Pune team. The first time I saw Commando play was in Siliguri. His tackle is amazing. Sanjana – Commando…I saw him play in Siliguri first and didn’t expect him to be so good. Then I saw him play in the tournament in Orissa. Kirpa – Tudu Sir…his passes and running is very good. Even Tiger Sir as he runs fast. If you could tackle somebody very hard, who would it be? Kirpa – Hupi and Meerarani of the KISS team, because they blocked my sister Sapna in the match in Nagpur! Sandhya – the same girls and Sumitra also from KISS! Punam – the 3 girls from KISS and a girl from Pune and Delhi even… I want to tackle almost everyone, so that we can win. Sanjana – The same goes for me and Bhagyashree and Surabhi of the Pune team. They play very well…if we manage to tackle them and restrict them; their team will become weaker, giving us the added advantage to win. Rugby action in the village! Any other sport you play? Punam – Cricket, football, athletics and even netball. How is it like to play netball? Sandhya – It’s fun to play, but one doesn’t have to run much in netball…it’s like get the possession of the ball, take 2 steps and pass. If you have to choose between netball and rugby, which one would you prefer? Together – Rugby, we get to run in rugby! Punam – Our team lost the netball match, because we were much shorter than the other team players and faced difficulties in scoring a goal. What would you like to achieve in your life, both in and outside rugby? Punam – There’s a lot I want to do. First, I want to complete my graduation and become a great rugby coach. Finally, find a job outside the village. Sandhya – I wanted to represent Bengal in Rugby, which I just did in the National Games. Now my aim is to represent India. And, when I earn some money through rugby, I would like to get my hair straightened in a posh parlour! Kirpa – I want to be a good player. I don’t know how far I can study, but I would definitely want to finish my schooling and work extremely hard after that to support my family. Such a long way still to go, sometimes we feel scared about what will happen to us. The Jungle Crows Foundation, through its unique open-for-all sport-for-development approach, has supported many children from disadvantaged communities over the years to express themselves through the medium of sports and reach their full potential. This interview series is an attempt to bring out the stories of several such young people associated with the Foundation, coming from diverse backgrounds, and develop a platform for further discussion and dialogue on the theme of sports and development.